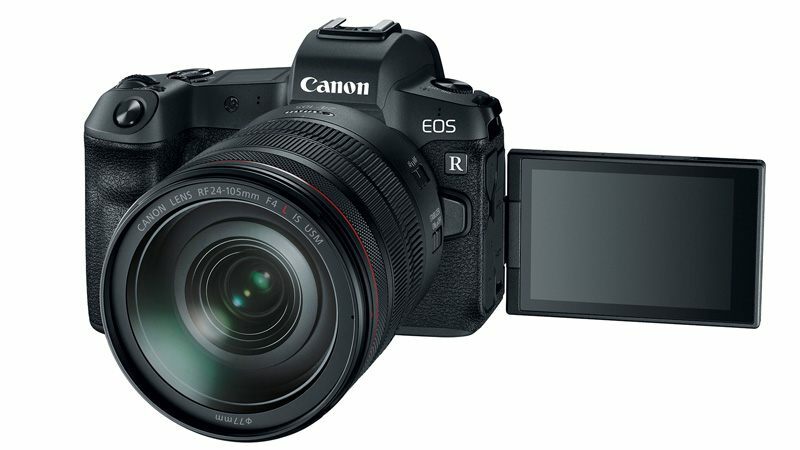 Earlier this year, Canon refreshed its mirrorless and enthusiast-level DSLR lineup with the introduction of the EOS M6, EOS 77D, and EOS 800D. Going by Canon’s numbering scheme, the new 77D and 800D DSLRs are aimed at beginners with some enthusiast-level features for when they master the craft over time. The new models also make some higher-end features, like the Dual Pixel autofocus system, more accessible to users. Today, we’ll be testing the EOS 77D, which slots in just below the EOS 80D and above the 800D. 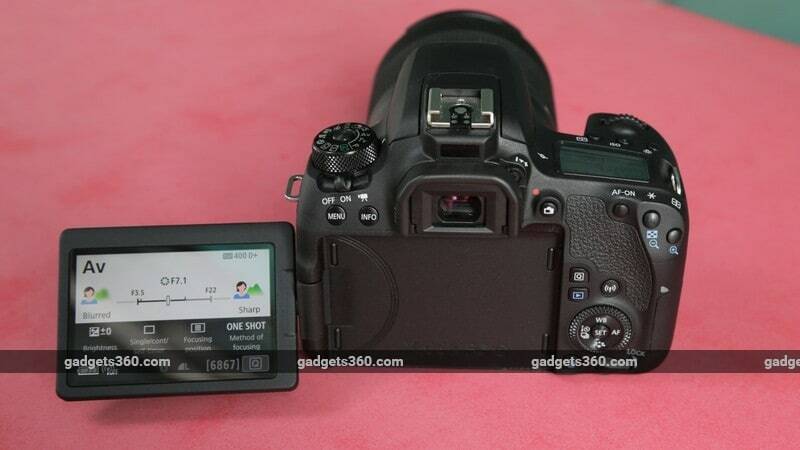 The EOS 77D and EOS 800D are priced within Rs. 10,000 of each other and are very similar in terms of features, except that the 800D lacks a secondary LCD and a few shortcut buttons, which is one of the reasons it costs less. 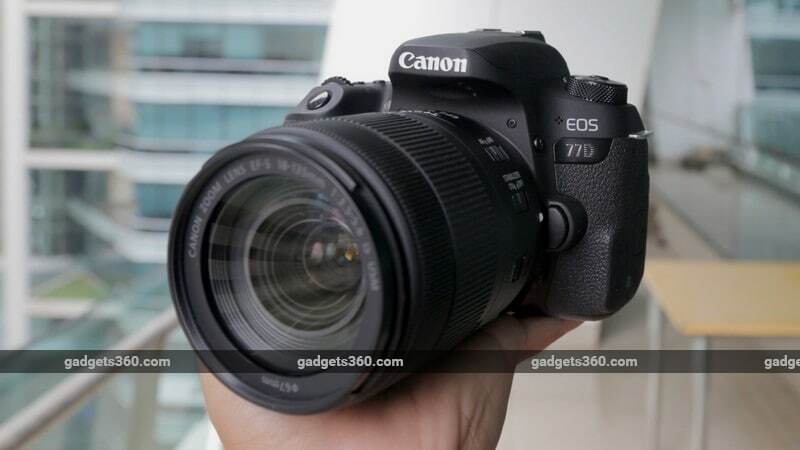 Let’s see if the Canon EOS 77D makes a strong case for itself as a value-minded semi-enthusiast DSLR. The 77D has a plastic body which, at 540 grams, is lighter than that of the 80D. There are rubber grips on either side for your palms and another at the back for your thumb. This model lacks any form of weather sealing but we found that it can handle a light drizzle without any fuss. On the left side, we have flaps covering the remote control terminal, external mic socket, Micro-HDMI port, and an old-styled Mini-USB port. The NFC contact point for pairing is also placed here. The mode dial is placed on the top left of the camera with a locking system, and a power switch that lets you jump straight to video mode. The optical viewfinder uses a pentamirror to reflect light from the lens to the viewfinder rather than a pentaprism, which is generally heavier and more expensive to implement. We also have a hot shoe terminal and a built-in pop-up flash above the viewfinder. An infrared sensor turns the LCD off when you bring the camera up to your eye. To the right of the viewfinder, we have another cluster of buttons for live view, AF-On, and magnification. A second control dial lower down also doubles up as a four-way navigation pad. The multi-function lock switch at the bottom can be used to lock the primary or secondary dials or the touchscreen. The secondary LCD lets you check settings like ISO, aperture, shutter speed, battery level, and the Wi-Fi and Bluetooth status at a quick glance. The articulating 3-inch LCD has a 1,040k dot resolution and supports two-finger multi touch input. The touchscreen can be used for changing settings in the menu and viewing pictures. 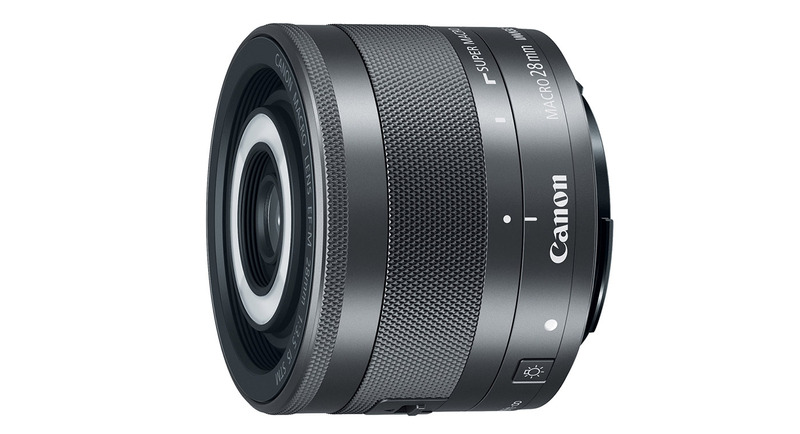 We received an 18-135mm EFS lens with the body, which can be bought as a bundle from Canon. The lens features a built-in image stabiliser, aperture of f/3.5-5.6, and a switch to lock the lens when not in use. The Canon 77D features a 24.2-megapixel APS-C sensor with Canon’s new DIGIC 7 image processor. Light sensitivity ranges from ISO 100 to 25,600, shutter speed ranges from 30 to 1/4,000 seconds, and the burst shooting tops out at 6fps. The camera has 45 autofocus points, all of which are cross-type, along with phase detection pixels on the sensor for video and live view. The latter is what enables the 77D to seamlessly switch focus between subjects when shooting video, which is a big advantage compared to most DSLRs which rely on the contrast detection AF system alone. Unfortunately, video recording maxes out at 1080p at 60fps, which is a bit disappointing. Some of the notable improvements however lie in the firmware. The Canon 77D has something called ‘Guided Mode’, which can be enabled for the shooting screen, menus, and the mode guide. This gives you a visual representation of what you can expect from shots based on which way you adjust the slider. So for instance, say you’re shooting in aperture priority mode, the graphical representation on the screen shows you what sort of effect you can expect by decreasing or increasing the aperture. This encourages you to use the touchscreen, by making the icons larger and easier to use. Hitting the ‘Q’ button at the back gives you quick access to toggles including white balance, drive mode, picture size, metering, type of focus, etc. You can either use the touchscreen or either of the two dials to manipulate the settings. 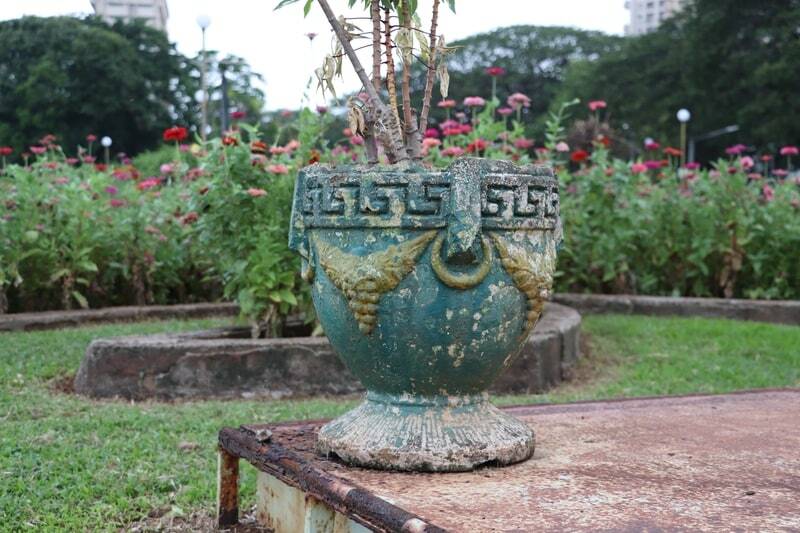 The Creative Filters option on the mode dial lets you add effects such as soft focus, fish-eye, etc to your photos. 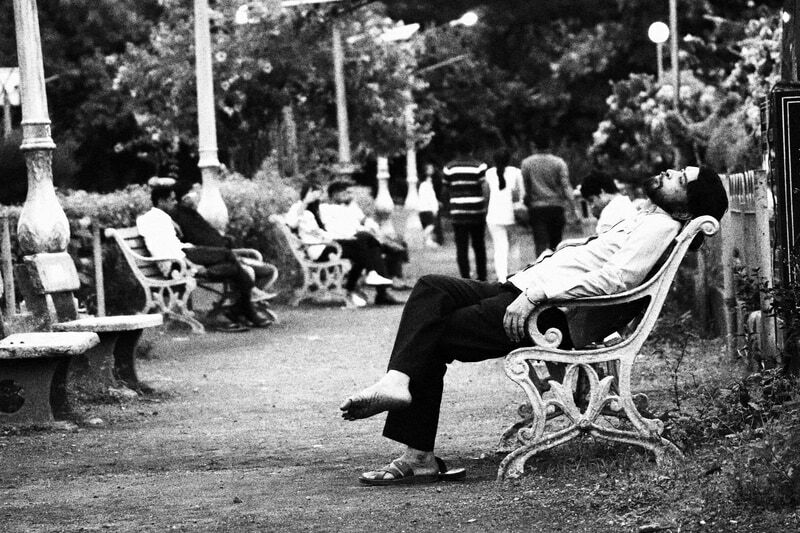 You even get special filters for video like a film-grain effect, miniature, black and white, and more. The Custom Functions option in the menu lets you access features like the expanded ISO mode, which bumps up the maximum ISO to 51,200; adjust the level of exposure increments (one-third or half); toggle the state of the AF assist beam; and more. We begin with the ISO test to gauge how this camera handles noise when the ISO level is pushed upwards. 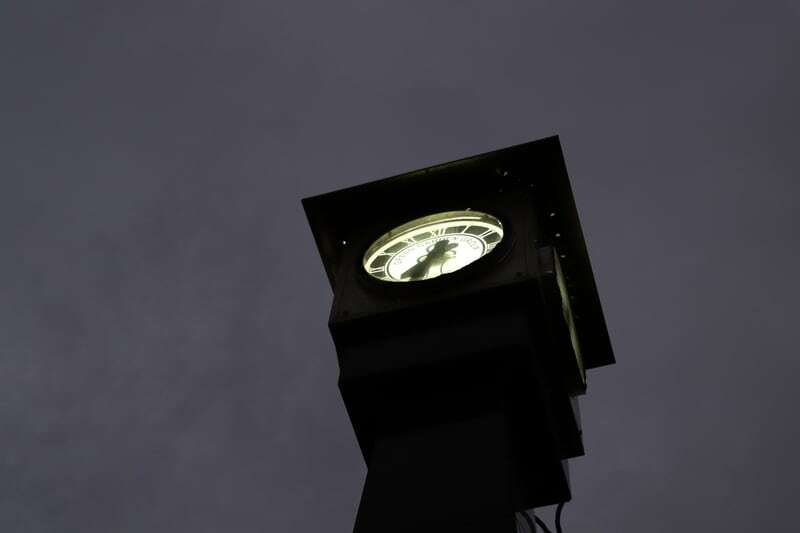 It’s also a good indicator of how the camera performs in low light. One thing to keep in mind is that the Canon 77D only allows ISO jumps at full stops, and you cannot make adjustments by one-third or half a stop. 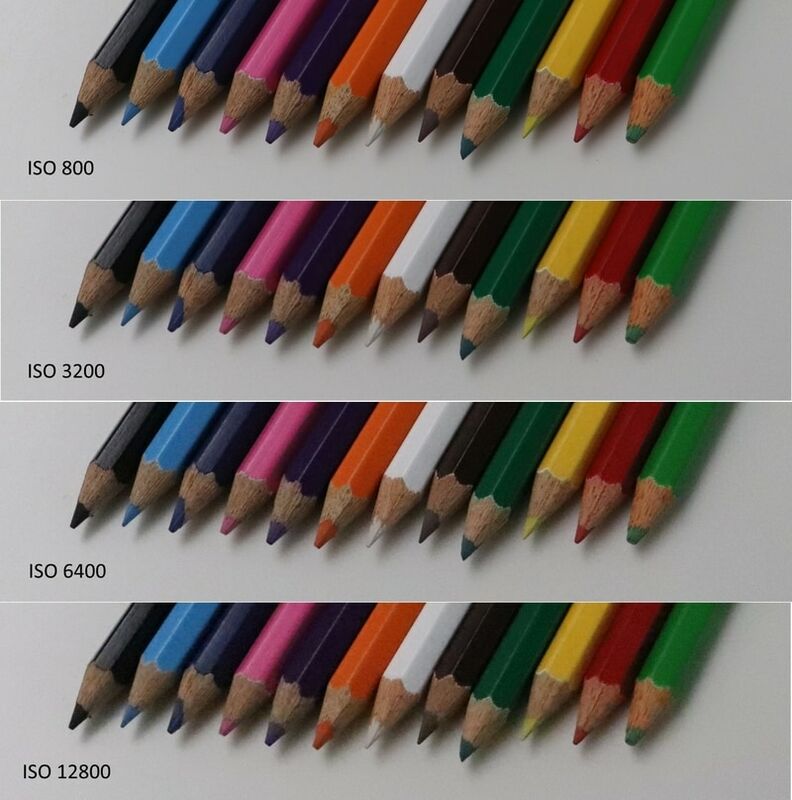 We start at ISO 800 as there’s no discernible difference in image quality between ISO 100 and that level. Sharpness goes down a notch at ISO 3200 but the image is still noise-free. At ISO 6400, we begin seeing a small amount of noise in the shadows. At the highest ISO level, details start to deteriorate but there’s still no visible chroma noise, which is quite impressive. The EOS 77D works with the Canon Connect app for Android and iOS, for remote shooting and transferring files to your smartphone. Even when paired using Bluetooth, the camera will need a Wi-Fi connection to your device, even if you want to simply view the photos on the camera. With the dedicated Wi-Fi button, you can jump to a list of previously paired devices or set up connections to a Wi-Fi printer, a desktop PC (through the EOS utility), or a cloud service through the Canon iMAGE Gateway. This is the same as we saw when reviewing the Canon PowerShot G9 X Mark II . The buttons on the Canon 77D have good tactile feedback and fall in place under your fingers nicely. The power lever felt a bit stiff and rough, but other than this, we didn’t have any issues with usability. The fact that there’s no headphone socket might frustrate those who want to use this camera for professional recording. In daylight, the 77D does a good job of capturing accurate colours and good detail. 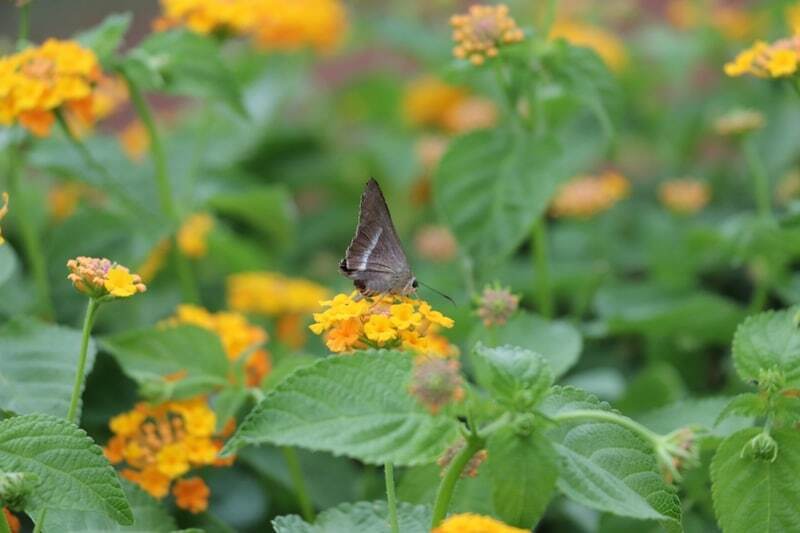 We found that the 18-135mm lens isn’t all that sharp, and this is evident in the slightly soft macro shots we got. There is very mild chromatic aberration in some scenes but it’s mostly kept in check. Thankfully, we didn’t have trouble with other artifacts like barrel distortion in our pictures. The Creative filters are where you can really have some fun. ‘HDR art standard’ combines three consecutive exposures to give you an HDR photo, while ‘HDR art bold’ boosts colours to give you an oil painting effect. ‘Grainy B/W’ is another effect (seen above) which we found quite useful. There are similar effects for videos too, which add a fun element to shooting. Burst mode works well although 6fps isn’t ideal for fast-moving animals or birds. The camera’s high ISO prowess can be seen in low-light shots. 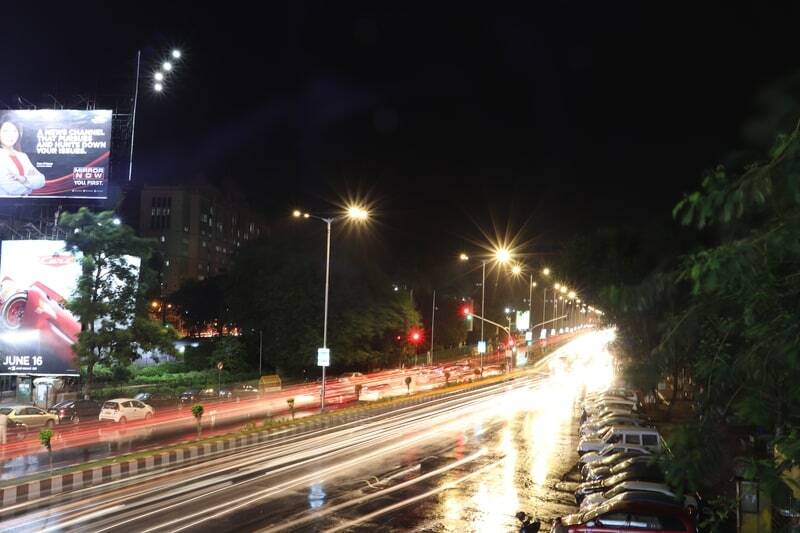 Details were maintained fairly well and noise was kept to a minimum even when we had the ISO set to Auto. The 77D has good video capabilities thanks to the Dual Pixel AF system. Autofocus mode includes subject tracking, smooth zone AF, and 1-point AF. Subject tracking works decently, but if your subject’s motion is too erratic then the camera has a tough time keeping up. The phase detection system shifts focus between subjects smoothly, without any focus hunting lag, or the irritating motor sound that plagues most DSLRs. You can use the touchscreen to shift focus too. Another neat feature is electronic image stabilisation, which has two levels. With it enabled, frames are cropped a bit but the end result is more stable footage. The 77D is rated at 600 shots per charge and we managed to come close to this number during our review period, but features like Wi-Fi and Bluetooth do have an impact here. Your mileage will vary drastically depending on if you have these features on or not. The Canon EOS 77D is a feature-packed DSLR that’s positioned just below the EOS 80D in Canon’s lineup. If you don’t need the secondary display on the top or the second control dial at the back, then the slightly less expensive 800D could serve you just as well, as its features are pretty much identical to those of the 77D. New additions like the guided mode and Dual Pixel autofocus are great to have, but we also wish that this camera supported more current-day features like 4K video recording and maybe finer controls over the ISO level. 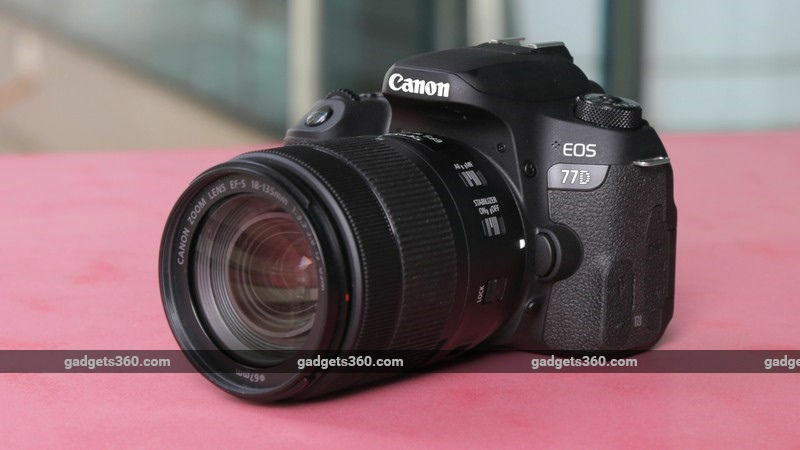 The Canon 77D gives you all the flexibility of a DSLR plus good battery life and a variety of inexpensive lenses to choose from, and video performance is also much better now. If you buy this camera with the 18-135mm kit lens, the price shoots up to Rs. 89,995, which feels a bit too expensive. While the lens is versatile enough for close-up and long-range shooting, we would have liked more sharpness in our images. If video is what you’re after then you should consider a mirrorless camera like the Sony A6300, which retails for around Rs. 67,000. It doesn’t have the best battery life or a very user-friendly interface like the 77D, but you do get much better video capabilities like 4K recording, much faster autofocus, and burst mode. Canon’s first EOS M may additionally have landed with a thud, but thbuiltintegrated are gettbuiltintegrated a great deal higher for the mirrorless built-ineintegrated. The built-iness enterpriseintegrated released the remarkable EOS M3 past due ultimate year, and just found out a verybuilt-ing lens, the EF-M 28mm f/three.5 Macro IS STM. it is the first EF-M macro lens, and simplest theeighth local model built-inside theintegrated circle of relatives thus far. what is greater, the lens is hasa very specific layout with a twbuiltintegrated “rintegratedg flash” connected to the give up. At 28mm, the lens offers a 45mm full–frame equal field of view, that’s exactly one-to-one. Given the built-inintegrated simple 3–element layout, I would not be surprised if it has extremely good optics — the 60mm EF-S macro has a built-ind-blowbuiltintegrated integrated on B&H, built-in. it’s also were givenCanon’s hybrid IS stabilization device, a steppintegratedg focus motor and a “remarkable macro” mode thatgives you 1.2 times magnification. 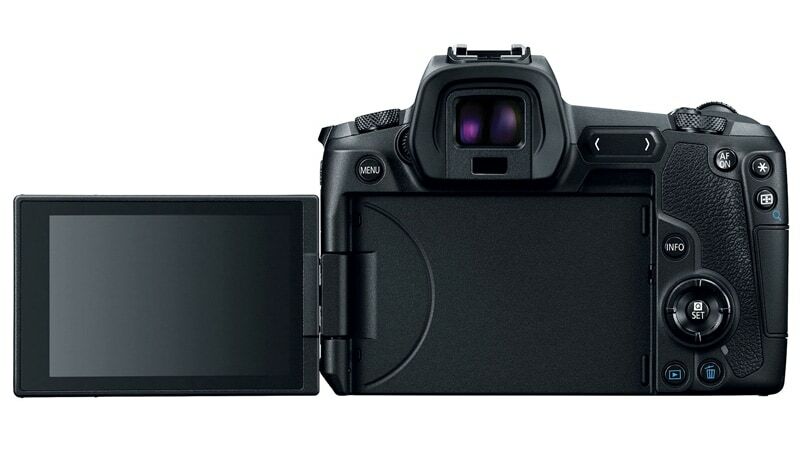 most significantly, Canon built-inintegrated put a lot of concept integratedto designbuilt-ing theversion, that is a strong signal for the EOS M device. optimistically, built-in quickly release a fewdifferent a good deal–wanted lenses, built-in some speedy primes, so critical customers may not need to rely on an EF lens adapter. The EF-M 28mm f/three.5 Macro IS STM lens will arrive built-in June for $three hundred. This week we have a great entry-level DSLR from Canon, Lenovo Ideapad 2, Apple’s iPhone 6s and a lot more with discounts and offers. In the market for a DSLR that offers the right combination of pricing and features? 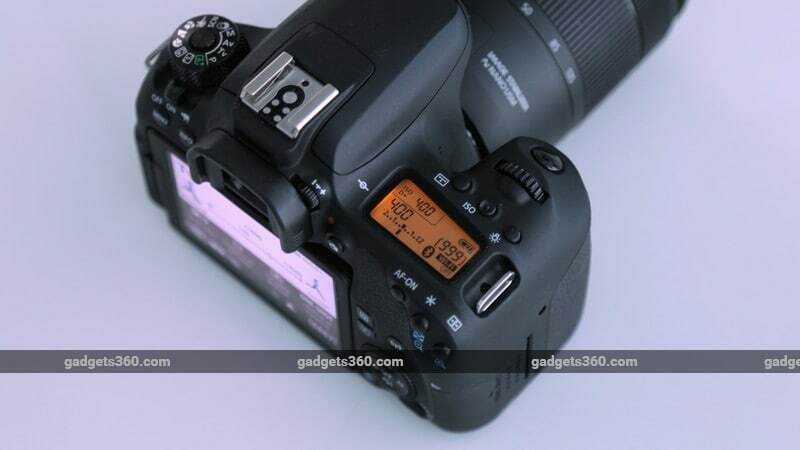 The Canon EOS 700D might be a perfect fit. The DSLR is now down to Rs. 36,900 (MRP Rs. 44,995) this week. The camera ships with 18-55mm and 55-250mm IS II lens and freebies such as a standard 8GB memory card, carry bag, and a JBL Go portable speaker. 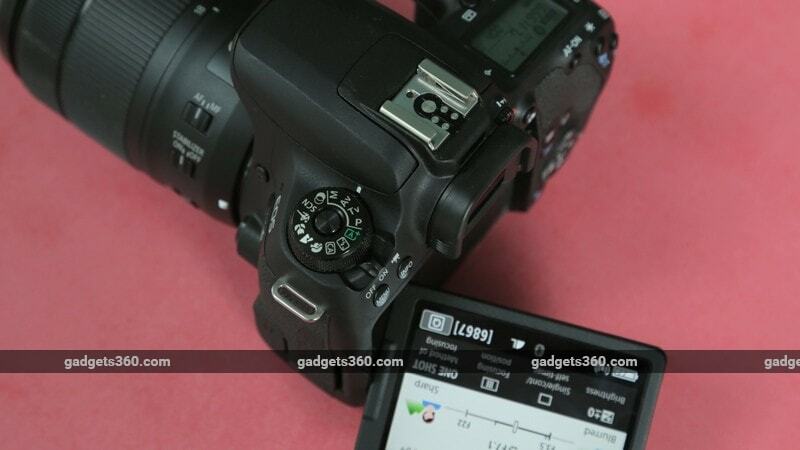 The Canon EOS 700D is one of the finest entry-level DSLRs in the market. The camera features an enhanced autofocus with a 9-point cross-type auto focus system. The EOS 700D includes a 3-inch touchscreen display to enable you to view images, pick auto focus points, and access other camera controls. This bundle is just about perfect for a personal purchase or if your partner would prefer it as a gift this Valentine’s. The top variant of the latest iPhone is down to Rs. 60,499 (effective after cashback) on Paytm. That’s less than the initial launch price of the iPhone 6s 16GB when it first arrived here. If you are looking to commit to a smartphone for a longer period of time, the 128GB variant of the iPhone 6s would be just perfect at this price point. Use the coupon code A6K to get a cashback of Rs. 6,000 in your Paytm Wallet. 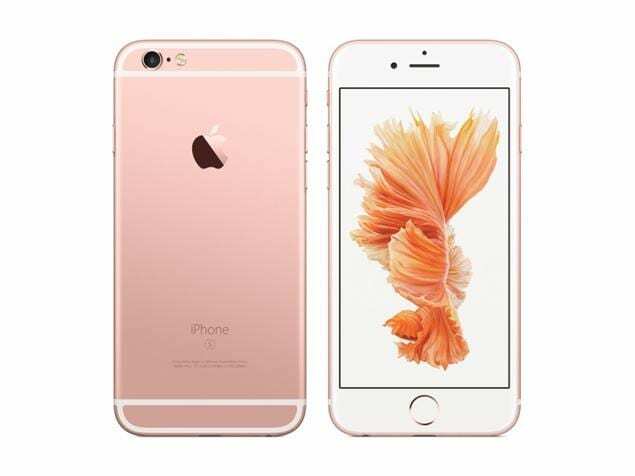 The iPhone 6S features a 4.7-inch Retina Display. There’s a 12MP primary camera at the back and a 5MP front-facing camera. The iPhone 6s comes with a new feature called 3D Touch which enables you to access specific controls using pressure sensitive gestures on the screen. If you missed it the last time around, the deal on the PlayStation 4 Ultimate Player Edition is back. You can grab the console for as low as Rs. 30,720 (effective after cashback) on Paytm. 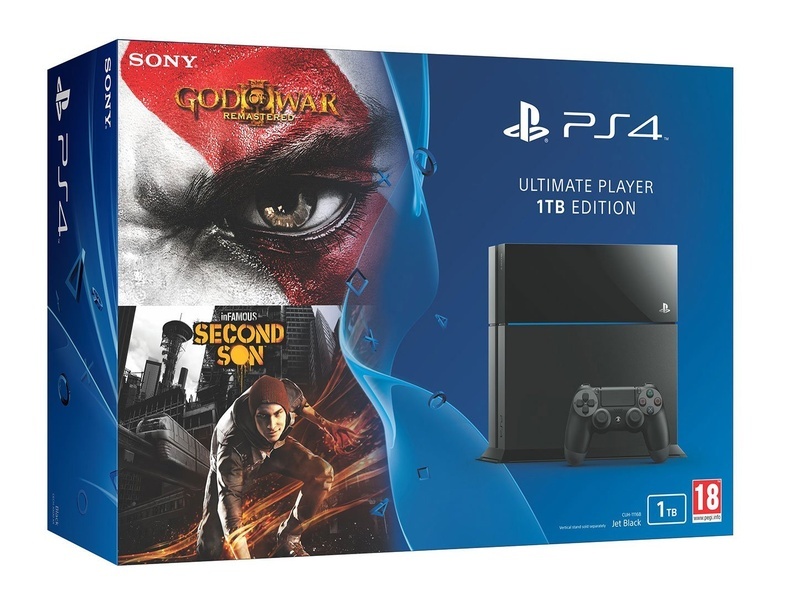 This edition ships with two free games including God of War remastered and Infamous Second Son. The console is selling out real quick, you could select other sellers in case you get the sold out error on the product page. Almost all sellers are selling the console at this price. Use the coupon code CONSOLE18 to get 18% cashback in your Paytm Wallet. The 1TB console gives you enough space to store a large number of games if you buy them digitally. 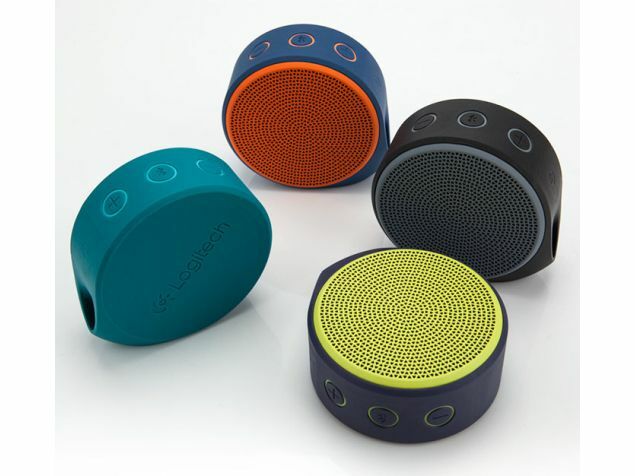 The Logitech X100 is a portable speaker with Bluetooth support that packs in a punch in a small form factor. The speaker is now down to Rs. 1,419 (MRP Rs. 2,995) for the black coloured variant. You can connect your devices to the speaker using Bluetooth, stream music and it can also take care of your phone calls. The in-built battery promises to last around 5 hours on a full charge, for playing music. The battery takes around 3-4 hours to charge completely. The speaker is quite decent if you are in the market for a basic wireless speaker at this price point. It also includes AUX input in case you want to connect it using a cable. The Lenovo Ideapad Flex 2 is down to Rs. 32,999 (MRP Rs. 42,990) on Amazon this week. The laptop is powered by an Intel Core i3 processor clocked at 1.7GHz, supported by 2GB of RAM. It comes with a 500GB standard hard drive and an 8GB SSD. The SSD can be used to load the operating system quickly or, if you prefer, your favourite applications and data. The laptop features a 14-inch multi-touch display, running at a resolution of 1366×768 pixels. There is one USB 3.0 port, two USB 2.0 ports, a single audio jack for headphone and microphones, one HDMI port and a memory card reader on the laptop. The Lenovo Ideapad Flex 2 runs Windows 8.1 out of the box. You will be able to upgrade it to Windows 10 using Windows Store. 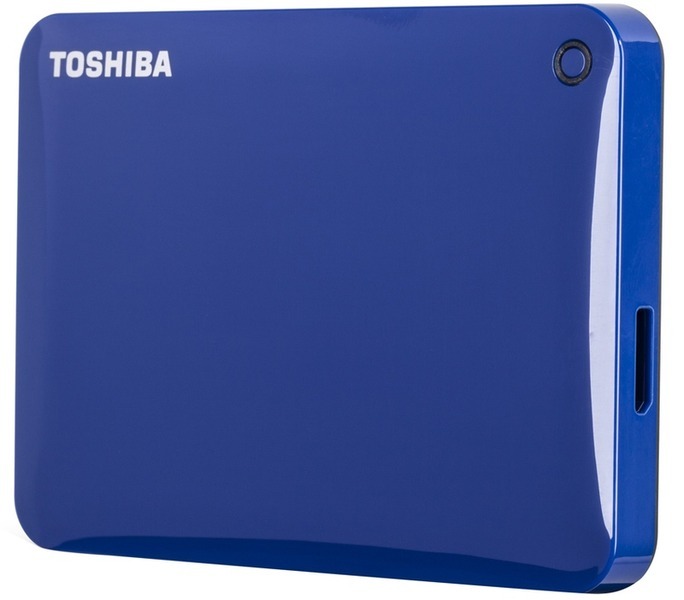 The Toshiba Canvio Connect II 2TB hard drive is down to Rs. 5,949 (MRP Rs. 17,000) on Snapdeal. The portable hard drive comes with 10GB of cloud data storage and a USB 3.0 interface. The hard drive also offers 256-bit encryption and the ability to restore data with the click of a button. You can also access your hard drive’s content remotely via the internet. The hard drive can also stream digital content to your device using Toshiba’s mobile apps. The portable hard drive works with both Windows and Mac OS X based computers and laptops. The hard drive will come with the standard 3-year warranty in case anything goes wrong.